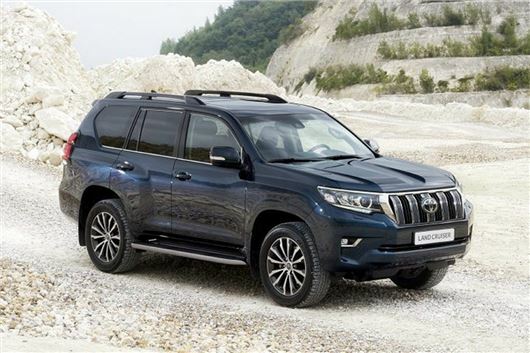 The Toyota Land Cruiser has been updated for 2018, with revised interior styling, new trim grades and improved levels of active safety equipment. The big Toyota SUV is on sale now from £32,795. Visually the Toyota Land Cruiser looks almost identical to the outgoing model, but those with eagle eyes will notice that the bumpers have been redesigned at the front. There are also new rear light clusters, which feature LED brake lights for the first time. The big 4x4 retains its 175PS 2.8-litre turbodiesel engine with the option of a six-speed automatic or manual transmission. As before, the manual version is the most-efficient, with Toyota claiming 39.2mpg and 190g/km of CO2. In comparison, the auto will return 38.2mpg and 194g/km. The updated dash incorporates an eight-inch touchscreen, dependent on specification on course. The cabin has been made more comfortable too with new seat materials and the options of front seat ventilation, rear seat heating and automatic climate control. The 2018 Land Cruiser has a revised model range for the UK which for the first time includes a workhorse Utility grade, with a simpler equipment specification. It's fitted with 17-inch steel wheels, roof rails, front fog lights, air conditioning, dusk-sensing headlights, cruise control, smart entry and a six-speaker audio system with CD player, Bluetooth, aux-in and USB port. Active grade adds rear parking sensors, dual-zone automatic air conditioning, leather steering wheel trim and Toyota's Touch 2 infotainment system with eight-inch touchscreen and nine-speaker audio. Icon and Invincible versions get active safety tech as standard, with a pre-collision system that will automatically activate the brakes when it thinks a low-speed impact is imminent. Buyers also get adaptive cruise control, lane departure warning and automatic high beam. Blind spot monitoring and rear cross traffic alerts are also available. Invincible is the range-topping models and comes equipped with a locking rear differential, off-road driving model selector, 360-degree panoramic camera and an under vehicle terrain view. Pricing starts from £32,795 for the entry-level three-door Utility model and rise to £52,295 for the Invincible trim. The Land Cruiser, like all Toyota models, is protected by a five-year/100,000-mile warranty as standard.